What does the “@” symbol do in Powershell? I've seen the @ symbol used in PowerShell to initialise arrays. What exactly does the @ symbol denote and where can I read more about it? Officially, @ is the "array operator." You can read more about it in the documentation that installed along with PowerShell, or in a book like "Windows PowerShell: TFM," which I co-authored. In PowerShell V2, @ is also the Splat operator. PS> # into a set of command line parameters. You can also wrap the output of a cmdlet (or pipeline) in @() to ensure that what you get back is an array rather than a single item. One more thing... an empty array (like to initialize a variable) is denoted @(). They are used for arrays and hashes. Not the answer you're looking for? Browse other questions tagged syntax powershell or ask your own question. 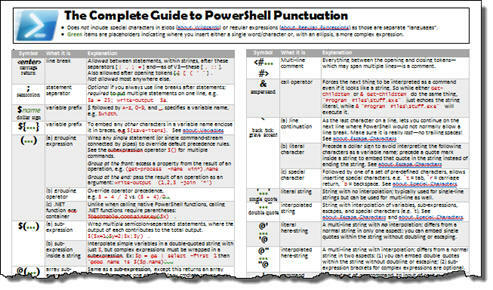 What does the & symbol in powershell mean? What is the @ parameter? What does ** (double star/asterisk) and * (star/asterisk) do for parameters? What does “static” mean in C? What does $_ mean in PowerShell? Why does ++[][+]+[+] return the string “10”? How do you comment out code in PowerShell?